AT THE GATES will soon be back on the road again in support of their comeback studio album and Century Media Records debut, At War With Reality. First up, AT THE GATES will embark on the Decibel Magazine Tour together with CONVERGE, PALLBEARER and label-mates VALLENFYRE across North America, starting March 27th. For more details, go HERE and also check out the tour-related cover feature for the current April issue of Decibel Magazine right HERE. To coincide with the start of the tour, AT THE GATES will release a very special split 7" EP together with label-mates VOIVOD on April 6th. 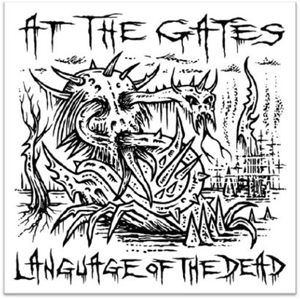 The 7" EP will feature the AT THE GATES bonus track "Language Of The Dead" from the At War With Reality sessions (previously unreleased on vinyl! ), while VOIVOD will contribute the new song "We Are Connected". The EP is "Double A-Sided" (meaning, each band has their own, reversible front-cover side!) and comes with artwork created for both bands by VOIVOD's Michel "Away" Langevin.